William Mandella is a reluctant hero, fighting in a distant interstellar war against unknowable and unconquerable aliens. But his greatest test will be returning to Earth. A few months of his tour of duty equate to centuries on his homeworld, during which he becomes increasingly isolated from the world he has been fighting to protect. Mandella returns home for the last time - to find humanity has evolved into a group conciousness which excludes him. Alone, alienated and missing the certainties of combat, he and his fellow verterans search for an escape - and finally look towards space. 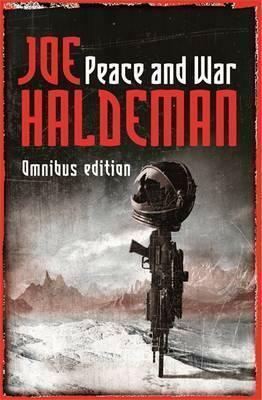 Joe Haldeman was born in Oklahoma in 1943 and studied physics and astronomy before serving as a combat engineer in Vietnam, where he was severely wounded and won a Purple Heart. The Forever War was his first SF novel and it won both the Hugo and Nebula awards, a feat which The Forever Peace repeated. He is also the author of, among others, Mindbridge, All My Sins Remembered, Worlds, Worlds Apart and Worlds Enough and Time.